BioShock isn't about a specific place, says creator Ken Levine, it's about an idea. What makes a BioShock game? Is it Andrew Ryan's philosophy, or the undersea city of Rapture? Is it the inextricably linked Big Daddies and Little Sisters? Is it plasmids, ADAM and Splicers? According to Ken Levine, it's none of the above, and he says that Infinite is just as much a BioShock game as the first two, despite its significant differences. To Levine, what characterizes a BioShock game are the themes and ideas, rather than specific details. 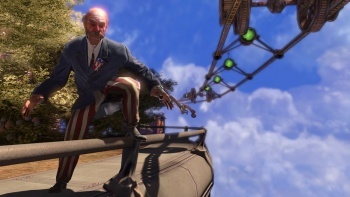 He said that elements like the Little Sisters and Rapture were just an expression of the concept that BioShock games try and communicate, and there were only two things a BioShock game had to have: a setting that was fantastical, but grounded enough in the human condition that it felt like it could be real, and a suite of abilities so that players could drive how they made their way through the game. He said that it made sense to use the name, because the feel of BioShock Infinite would be so familiar, people would almost expect it. Levine said it was Irrational's mission to make some similar, but different at the same time, and judging from the reaction to the teaser trailer, more BioShock, but not set in Rapture, is exactly what a lot of fans want. BioShock: Infinite is scheduled for release sometime in 2012.